Starting out in web development can mean a huge number of different things. There are three main tracks you can get on to become a web developer. The strongest web development careers, and the greatest success, are most likely to come to those who combine the first two. Graphic design is simply making web pages look good in a way that also supports them working well for their intended users. Today, people who do strictly defined graphic design work are usually called visual designers, but the overall field they work in is still usually called graphic design. Graphic design combines art, interface design, and interaction design. Designers mostly create layouts rather than specific, attractive-looking graphics. That’s the difference between a designer and an artist. Also, designers create pages that support user interaction well, but they don’t worry too much about optimizing exactly where users click or how they work their way through a multi-step process, like buying a cardigan online. To get into graphic design, take classes or look for professional opportunities where you create designs using Photoshop. Use these opportunities to start building up your portfolio. To stay in graphic design and build your career, you need to keep improving your portfolio — both the actual body of work you’ve done, and its online representation in your personal portfolio. You want to be taking on varied projects — small and large, complex and simple, design-led and content-led. Show that you can do it all. HTML: HTML, or HyperText Markup Language, is the code that tells a web browser what the different elements are on a page. There is an old-school and a theoretically pure approach to using HTML. In the old school, you used HTML to say what something should look like — bold or italic, specific font sizes, and so on. In the theoretically pure approach, you would simply state that something should be emphasized, and not specify that that meant bolding it. CSS: CSS, or Cascading Style Sheets, are layout instructions that specify pretty exactly how content should look on a page. Strong use of CSS greatly reduces the amount of work that has to be done in HTML; the way things look is almost completely controlled by CSS, and very little by HTML. The secret to success as a front-end developer over time is twofold. First, keep on top of the constant evolution in standards and the constant churn and growth in delivery platforms. To start learning, you can use a bunch of resources that are, of course, mostly online. Codecademy and W3Schools are two of the leaders. 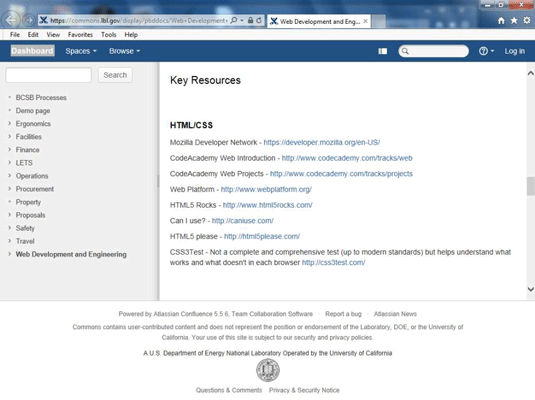 For links to these resources and more, visit the Lawrence Berkeley Labs page. Content developers create content for online. That sounds simple, until you ask yourself — what is content? Words: Writers for online develop a specialized approach to one of the oldest tasks in the book — writing in a way that people understand and enjoy. Reading online is physically harder for online users, who are basically staring into a light bulb as they read. So smart content developers use fewer words, lots of headings and bulleted lists, links to complex information, and more pictures. Images: Interesting images are vital for successful communication online, and they’re often neglected. Images are often abandoned for display on a smartphone, for instance, so their value to the entire project is therefore diminished — a hefty proportion of the website’s users will never see them. But carefully crafted images can do a lot to carry the message of a web page forward and of advertising to accompany them. If you want to be a web artist, consider making yourself useful as a visual designer first, and then choose projects and job roles that take more and more advantage of your artistic talents. One important area of growth is infographics — large graphics, often big enough to nearly fill a laptop screen, which convey a great deal of information at a glance. 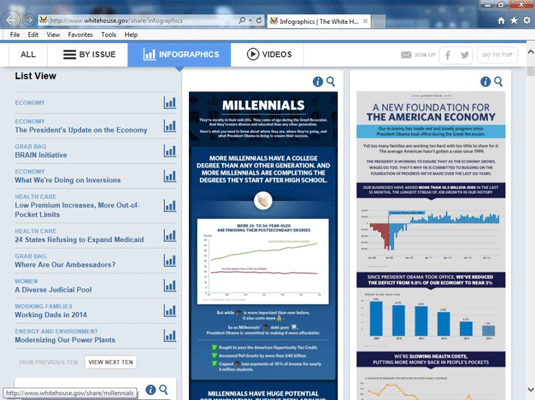 Check here to see how the White House uses infographics. Multimedia: There’s a lot of overlap here with web artists, but there’s a lot of technology and planning that goes into the successful use of multimedia. To be a successful multimedia content developer, you need a combination of artistic insight and technical savvy that will give amazing results from a very limited budget of time, money, and streaming capacity. You need the ability to meet a strict budget and the ability to create content that can “go viral” and carry a sponsor’s message to unexpected corners of the Internet. You also need to constantly update your toolkit with new hardware and software tools and your portfolio with interesting new projects, including a combination of pro bono or volunteer and paid work.